Having barely scraped through the last election by only 346 votes and with polls showing that she will lose the seat next time round, millionaire Amber Rudd is in a panic. She has spent a huge amount of money on hiring all kinds of PR staff and even brought in polling strategist Lynton Crosby, but still the popularity of the rarely-seen Rudd keeps on falling lower and lower in Hastings. Her latest bright idea was to hold a “campaign action day” in Hastings on Saturday 21 October. The Tory chief whip Gavin Williamson was enlisted to summon up as many fellow MPs as he could but still there was the major problem that there just aren’t enough local Tories to even fill out the background in her photo opportunities – so they just went and bought some supporters from out of town instead. The Tory Party are paying students from Oxford University to come 130 miles to Hastings so they can campaign for Amber Rudd. The Tory Reform Group is also paying for a coach to try and bring a few London Tories down to Hastings. Unfortunately, even the offer of a free day trip to the seaside is not pulling in very many volunteers and the coach is virtually empty. 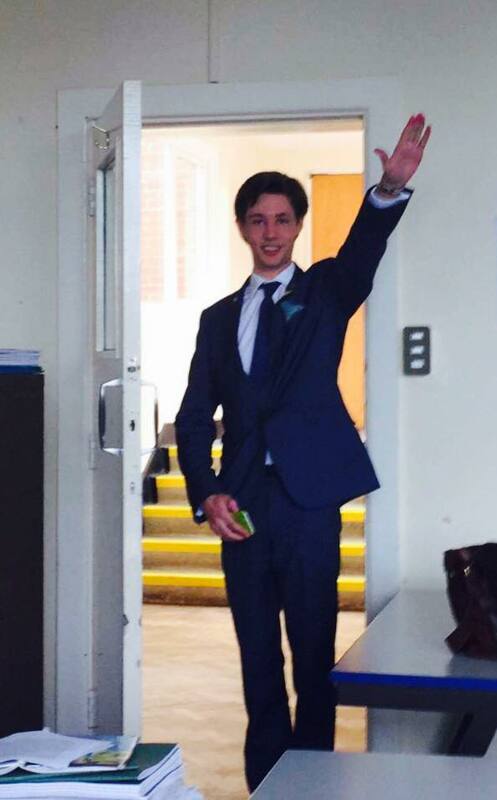 Amongst the small number of Oxford University students who have signed up for the free trip is George Wright (shown below giving a Nazi salute). How Amber Rudd thinks that paying a bunch of Fascist sympathisers and privileged public schoolboys is going to improve her popularity in one of the most deprived seaside towns in the country is anyone’s guess. What we do know is that they are not going to get a very friendly welcome! 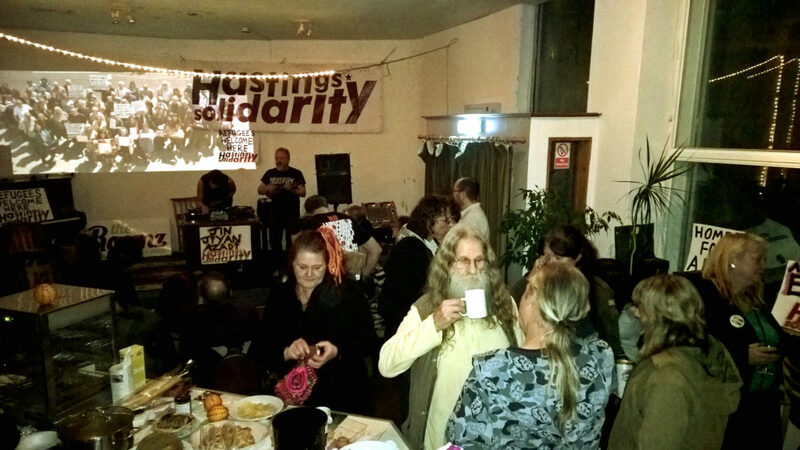 2016 was a busy year for Hastings Solidarity – before we forget all the great things that we were part of, we thought it would be worth a quick round-up of the year’s events, that will hopefully inspire you to remember that it’s not all doom and gloom and that we still have lots of work to do! 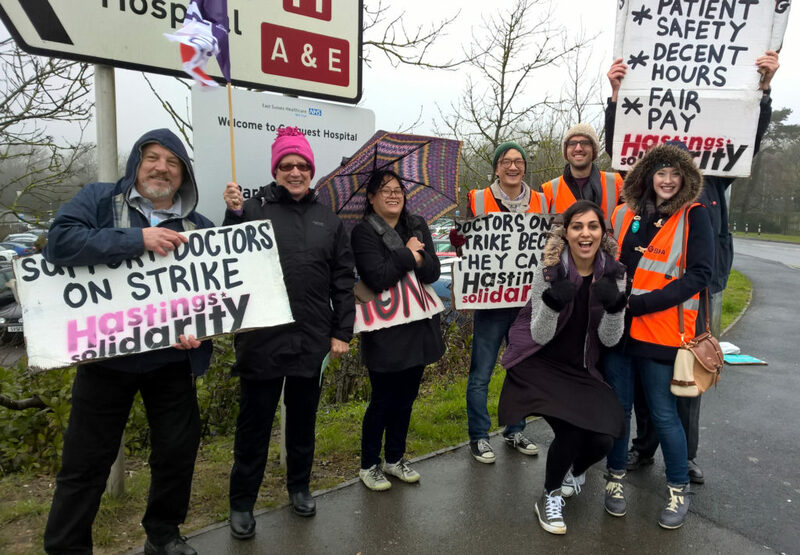 We started 2016 with demonstrations and picket line support for the Junior Doctors strike. Before the strike started we set up a stall in Hastings with a giant card which we asked people to sign or leave messages of support for the doctors on strike. When the strike started we took the card up to the picket line at the Conquest to show the strikers that the people of Hastings support them. On 30 January we organised transport for local people to oppose a National Front demonstration in Dover. We stood with Kent Anti-Racist Network and a long list of trade union and community organisations to show solidarity with refugees and to prevent an escalation of racist violence. The demonstration turned out to be one of the most violent for decades and was a turning point in stopping the growth of a Fascist street movement. In February we organised a free skills training workshop to empower people involved with Hastings Solidarity . We developed our skills in consensus decision making, facilitation skills and group dynamics to help make sure everyone feels confident in organising meetings. It was a really good event with lots of useful outcomes. 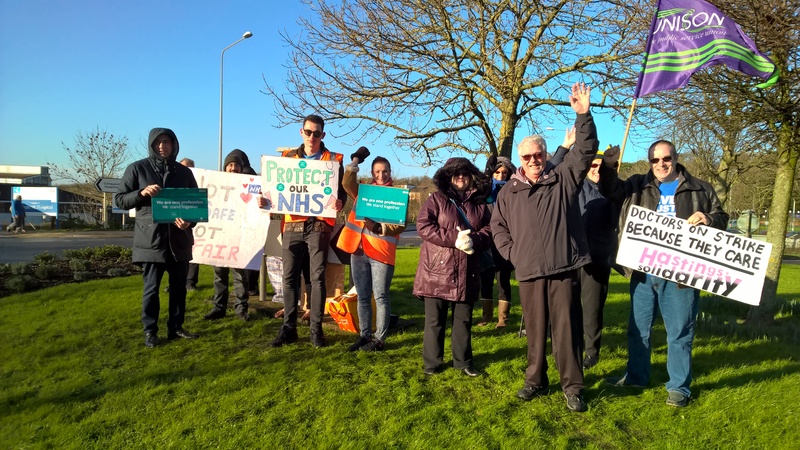 In March we supported another Junior Doctors strike and played an active part in two large demonstrations organised by students in Hastings to fight the closure of our University Campus. We gave Amber Rudd a very unwelcome reception at her Transport Summit – so that she complained of feeling “unsafe” and had to be smuggled out of the back door afterwards. 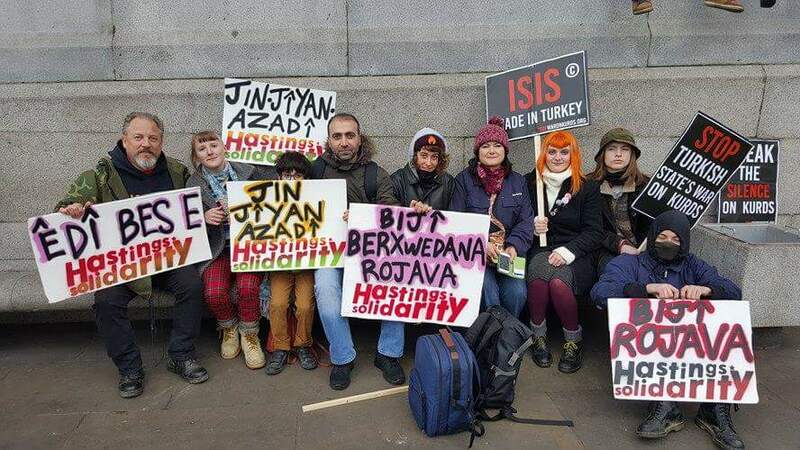 We sent a group to the very well attended national Kurdish Solidarity demonstration in London and made some good new connections with local Kurdish activists. 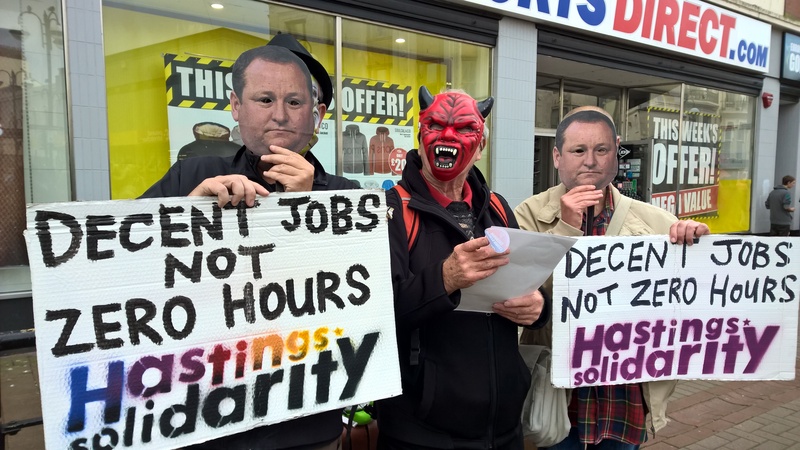 We organised a demonstration outside Sports Direct against zero hours contracts, took part in the national Day of Action against Benefit Sanctions and held the first meeting of a new grassroots union organising initiative. Throughout 2016 we were actively involved in trying to organise the setting up of a mutual aid food bank and solidarity centre for Hastings. We had the first of our Food Bank Group meetings in April, where we talked about the relationships we were building with a charity called FareShare in Brighton who can provide the food for our parcels and that we are working with a number of other projects locally as part of “Hastings Food Network”. During the course of the year we identified three different venues that we could use for the project. Unfortunately each one of these fell through and we have finished the year without making the progress we wanted – and we are still searching for a place to operate the food bank. Also in April we supported 4 days of junior doctors’ strikes on the picket line and with events in Hastings and St Leonards. We also organised a “We Support Junior Doctors – We Support the NHS” march through the town which was very enthusiastically supported despite the rain! 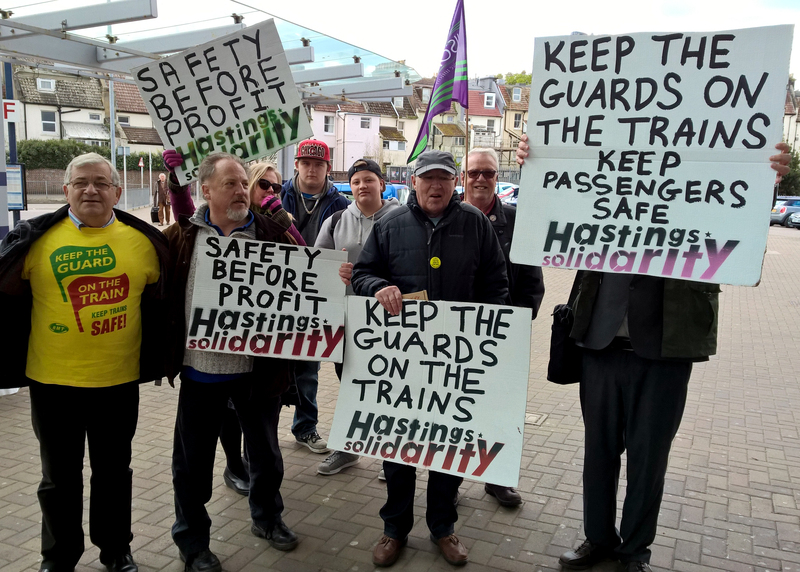 At the start of what turned out to be a very long dispute, we joined a strike day at Hastings station held by RMT members on Southern Trains and organised another meeting of the new grassroots Hastings Union Group for local union activists. We were also active outside of Hastings this month. We sent a large group to confront the National Front in Dover and were happy to see that physical opposition has seen the numbers of Fascists steadily drop on every occasion. 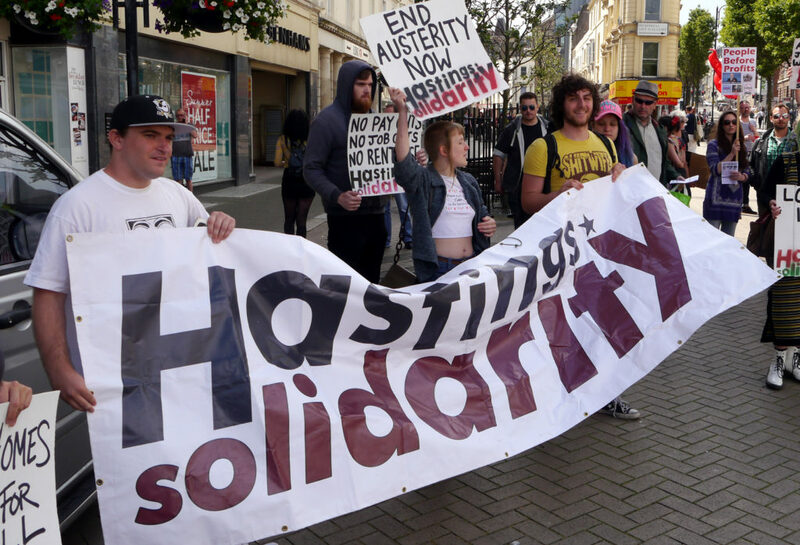 Several Hastings Solidarity supporters joined a student demonstration in Brighton as part of the campaign to save Hastings University Campus, temporarily occupying the offices of the University management. 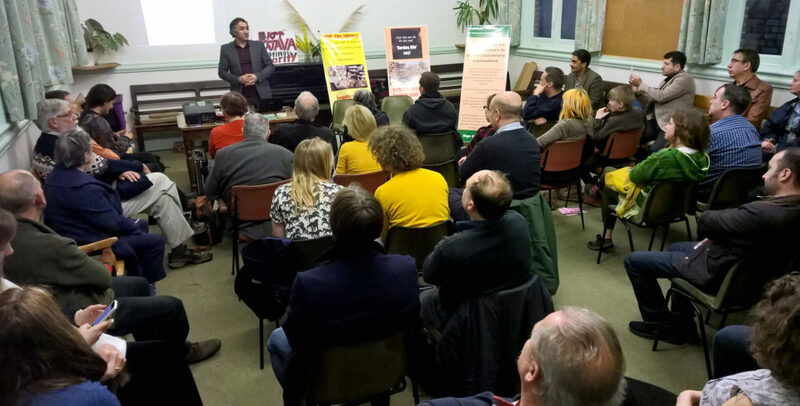 We organised a very well attended meeting in Hastings to discuss Kurdish solidarity and hear news from the feminist revolution happening in Rojava. On May 1st we took part in the very enjoyable Reclaim May Day march to Hastings Pier following a brass band through the town. We also started a series of well-attended and lively social events that ran through the summer, discussing ideas that included mutual aid, nationalism and Fascism and workplace organising. We joined the Hands Off Hastings campaign on their march through the town to fight against the closure of the Hastings university campus. 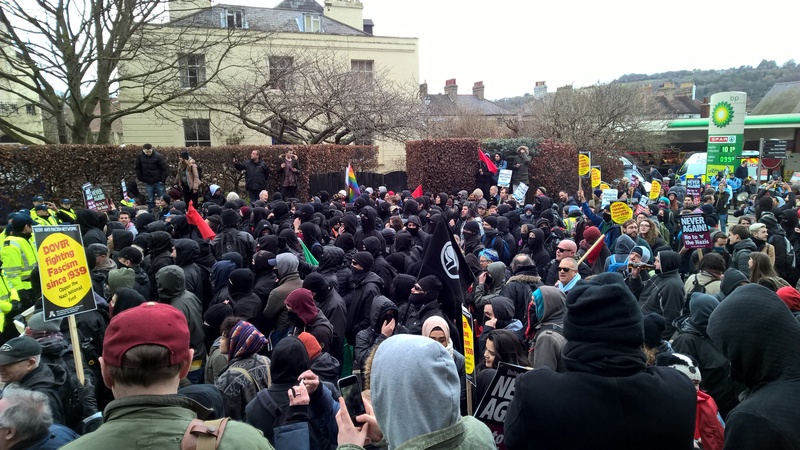 We also lent support to Brighton anti-Fascists opposing a tiny anti-immigration demonstration in their city. 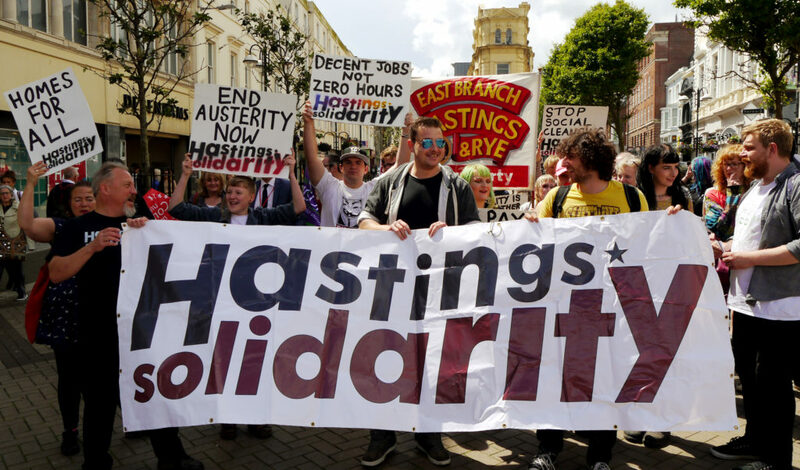 After the Brexit referendum result in June we organised a successful demonstration in the centre of Hastings to say “End Austerity Now!” and show solidarity with migrants and refugees. We took part in the Hastings demonstration against violence against women. We also organised a meeting in with the local Kurdish Community to build on our public meeting about Rojava in April. Early on in the month as a new idea for Hastings Solidarity we organised a public meeting where the author Richard Seymour came to Hastings to discuss his new book about Jeremy Corbyn. It was an interesting evening with a good turnout and a lively discussion. I August we were involved in actively supporting the RMT strike on Southern Rail. 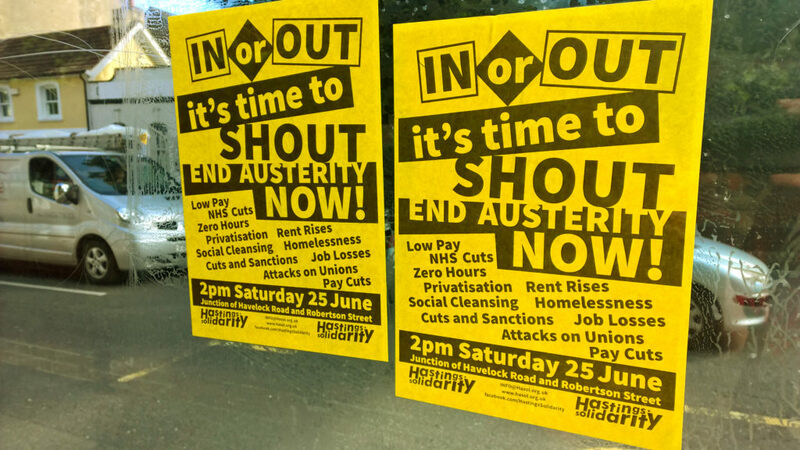 We also celebrated victories in our long running campaign against zero hour contracts at Sports Direct and Wetherspoons (both companies have now agreed to offer guaranteed hours for their staff). The most exciting thing that happened this month was our very successful food donation event on 22 October. 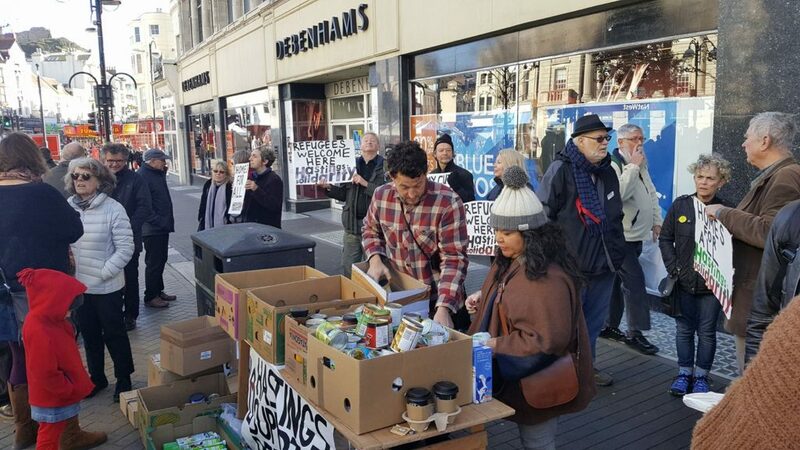 After a Fascist group from Portsmouth threatened to hold an anti-refugee demonstration in Hastings, we were able to organise both an anti-Fascist response and a food donation event with Hastings Supports Refugees at very short notice. Local people turned out in their hundreds to show their support. 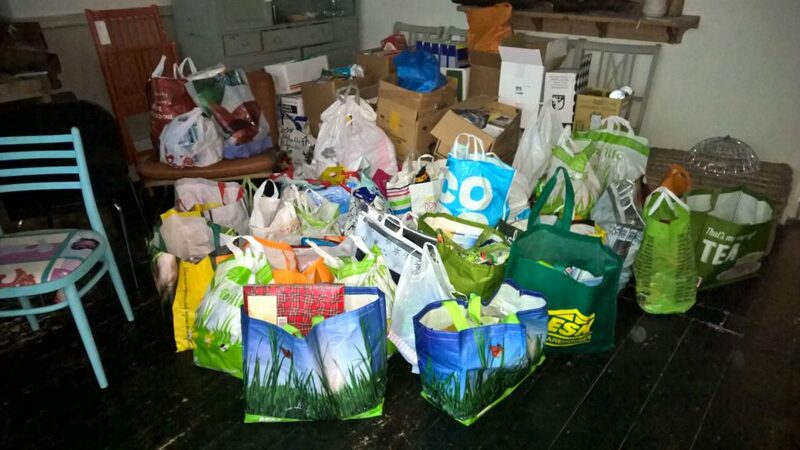 We collected more donations for Hastings Food Bank and refugees in Calais than we could actually cope with – in the end we collected over HALF A TON of donations for Hastings Food Bank (enough for 1,304 meals) and a similar amount for refugees, which was totally fantastic. The Fascists didn’t turn up and the demonstration really showed what solidarity looks like. Events like this show in a direct way how by working together in solidarity we have had a transformative effect on our community over the past two years since Hastings Solidarity was launched. We explored this idea a few days later with an interesting discussion evening “Hastings Solidarity – What Next?”. 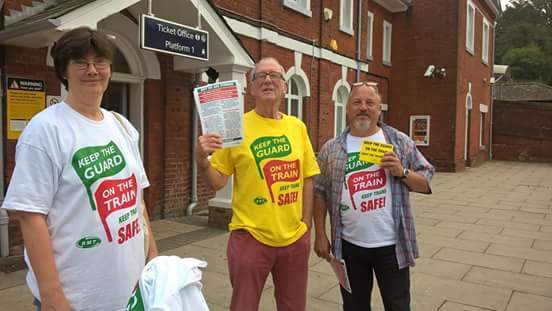 At our local train stations, Hastings Solidarity members continued to leaflet and support striking RMT members at a number of demonstrations on strike days throughout the month. We got some bad news this month. After lots of work we were told that the third of our food bank venue options had fallen through. We also didn’t get awarded crucial funding that we were counting on for the food bank and had to go back to the drawing board to figure out how we can move this vital project forward. We are now looking at organising a series of informal public meetings around all the different parts of Hastings through 2017 to raise interest and collect ideas from local people about the issues they care about the most. We ended the year with a lovely Hastings Solidarity Xmas Party with lots of great DJs, live music and fun! Over the past two years Hastings Solidarity has been the decisive factor in enabling people in Hastings to show support for striking workers like the Junior Doctors; in getting people in Hastings to Dover to mobilise against a very real fascist threat; in providing a voice for tenants in poor housing through the Hastings Tenants Union; in the people of Hastings getting out on the streets to oppose zero hours contracts, job cuts, austerity measures, social cleansing and Amber Rudd; in showing support for the Brighton University students opposition to campus closure and in saying Hastings Welcomes Refugees. 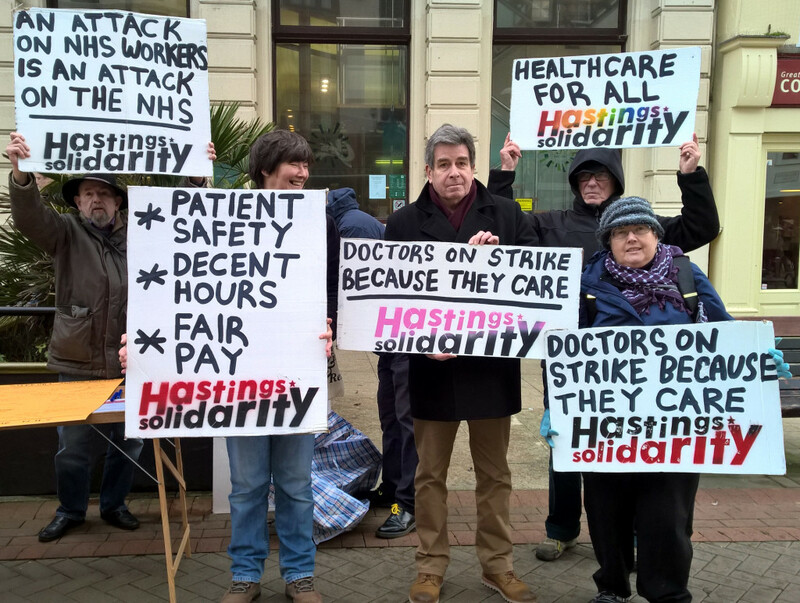 If you think these issues are important, then you need to be part of Hastings Solidarity. Please don’t assume Hastings Solidarity will continue without your support and involvement. 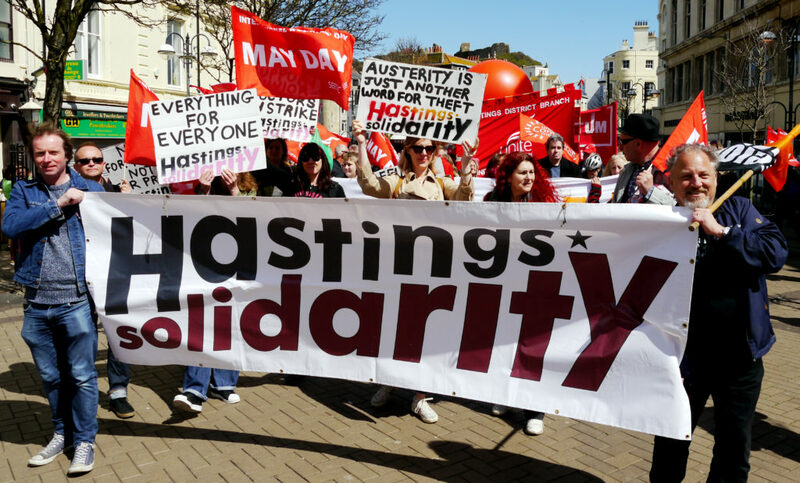 Hastings Solidarity has helped us make the crucial links between different groups of workers, different communities and different interest groups. And it is Hastings Solidarity that has somehow made those links crackle with creativity and a sense of hope. 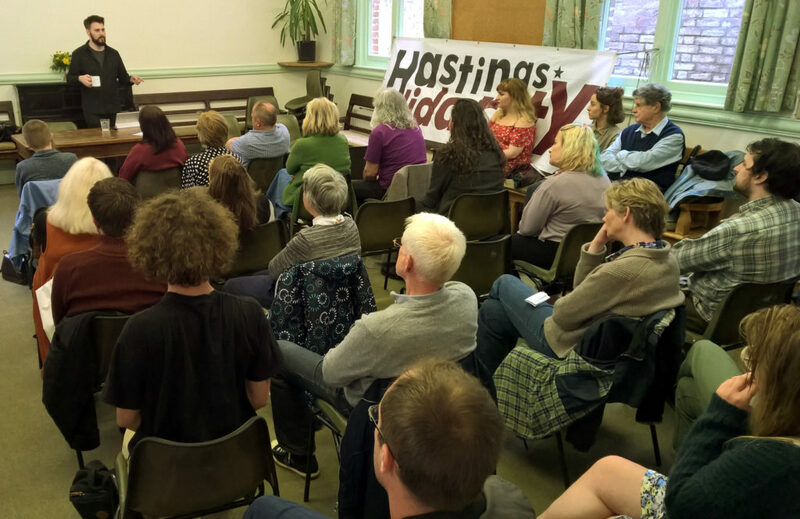 If you would like to see Hastings Solidarity continue, and if you can play a part in that, even a small part, please come along to our regular monthly meetings and get involved. Our meetings are completely open and democratic – everyone has an equal say in what we do. Solidarity isn’t an abstract thing, it’s actually helping each other. And right now that’s what we need. As the leaves turn yellow a chill in the air makes us wrap up warm. We thank our lucky stars we’re not homeless or living in a refugee camp in some forgotten corner of Europe. Winter’s coming soon, it always does. No sooner than Hastings Council offers to help 100 refugees find places in private accommodation in our town then rumours start to swirl around that they’re going to be jumping the housing list. As if the national shortage of social housing is down to a handful of refugees rather than deliberate Government policy. And before you know it, a tiny bunch of neo-Nazis from Portsmouth decides that they will come over to explain to us how we’re doing it all wrong. They say they’re going to show that Hastings doesn’t want to help people escaping from war and terror – and they’re going to do this by marching through our town throwing up Hitler salutes. But as sure as the seasons change, Hastings shows that we won’t ever be bullied by Fascists. Too many of us know what it’s like to struggle to get by on low pay and benefits or to be hungry and homeless. We know that helping and supporting each other is the way to make things better, not fighting amongst ourselves or blaming foreigners for our problems. 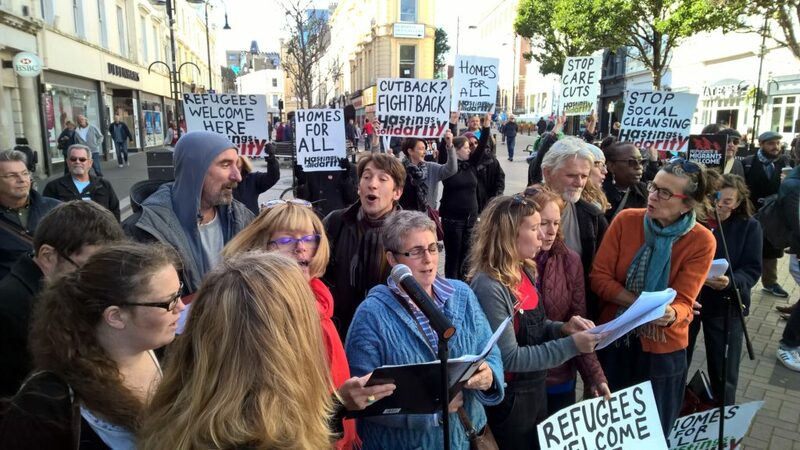 So, on Saturday the 22nd of October, hundreds of people in Hastings came out in a show of solidarity with our friends and family here in our community who are suffering the effects of Government austerity – and with our brothers and sisters who come here from across the sea as refugees. 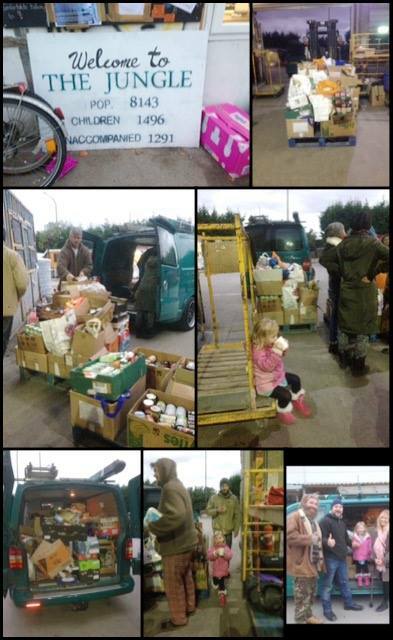 A network of community groups and individuals arranged a food collection for Hastings Food Bank and refugees in Calais. 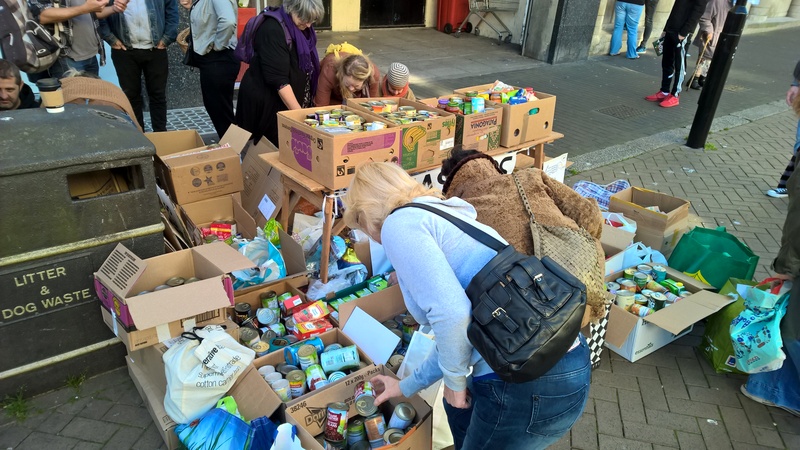 With barely a week to organise it, the event was remarkably successful – thousands of pounds worth of food and clothing were donated. The contributions were so generous that organisers even had to arrange for extra space to store the food. Instead of Hastings being scared off by the threat of Fascist violence it turned out that it was the Fascists who were afraid to show their faces. And the people of Hastings showed that they support all those in need – wherever they are from. Good turnout this afternoon – more than 80 local people came down to say “The vote was out, it’s time to shout: End Austerity NOW!”, to show support for refugees and to campaign against low pay. Let’s try to keep this going – get involved in local solidarity action. Supporting international working class solidarity. We have absolutely no interest in politicians. We believe that by working together we can do things better without them. We come from many different backgrounds and we are defined by what we do, not by political labels (our political differences don’t matter at the moment as long as we agree that this is how we work together). We’re not leading local struggles – we are led by local struggles. We are supporting and helping each other, working with communities we are part of not apart from. We want to hear your voices, your ideas, opinions, feedback, what you’re angry about, what you want to do about it. And we want to do it together. We’re not really a traditional kind of political group. We don’t do things just for the sake of it or because that’s the sort of thing we’re “supposed” to do. We haven’t got the time, interest or resources for that. We won’t be providing “cannon fodder” for mainstream political parties. We are not social services, not a charity, not an advice line, not a protest group, not lobbyists. We’re not a safety valve for the problems of society – we want to change society. We are about mutual aid, building networks and solidarity. We think the way to make real change is through collective action. We want to challenge the existing state of things, to be antagonistic, make demands. We work together to support each other and amplify our struggles. We make real change. We want to be able to offer a place to go if you’re stuck, if you’re alone, if you’re angry, if your union is ineffectual – come talk to us and let’s see what we can do… together.